The mycology laboratory plays a vital role in the diagnosis of fungal infections through the recovery and identification of the etiologic agent. Specimen collection from appropriate sites is critical, as is the proper transport, storage, and processing of samples. 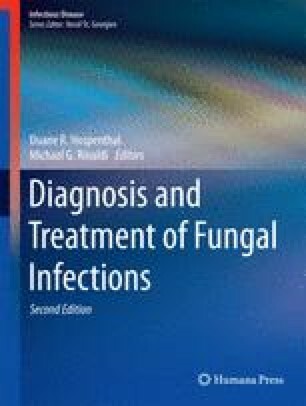 Fungal elements seen by direct microscopy often provide the first clues to a fungal infection, and are the basis upon which empiric therapy is initiated. To ensure recovery of the fungus, a sufficient number and types of media should be utilized for primary isolation based upon the clinical history and the possible organisms expected. Accurate fungal identification, in combination with antifungal susceptibility testing, provides the basis for appropriate organism-directed antifungal therapy and is essential for conducting epidemiologic investigations. Human and/or animal pathogens historically considered to be fungal are now placed in three kingdoms: Fungi, Straminipila (Stramenopila), containing the Oomycete Pythium, and Protoctista, with the bulk of the human pathogens in the kingdom Fungi. Organisms within this kingdom are eukaryotic (have cells containing a membrane-bound nucleus), heterotrophic (lack chlorophyll or other pigments capable of photosynthesis for making food, therefore must obtain nourishment from an external food source), may be unicellular or filamentous, and have cells surrounded by cell walls containing glucan, chitin, or both. Unlike animals, fungi possess cell walls, but unlike plants, the major cell wall component is not cellulose. In the past, medical problems attributed to these organisms, in comparison to those caused by the bacteria, viruses, and parasites, have been relatively few, and included allergic symptoms, mushroom poisoning, mycotoxicoses from the ingested fungal toxins, and occasional fungal infections. However, with the advent of modern medical advances utilizing immunosuppressive regimens, and with an increase in diseases/underlying conditions significantly altering the human immune system, fungal infections (mycoses) have increased significantly over the past couple decades. The recovery of these organisms from host tissue and their identification is often critical to the diagnosis and treatment of mycotic disease and is the classic method for documentation of pathogenicity. Histopathology and other adjunctive tools, such as antigen or antibody assays and molecular techniques, addressed elsewhere in this text, may also be relied upon for empiric/preemptive therapeutic decisions, when cultures are either not available or fail to provide unequivocal information. The proper collection, transport, and processing of specimens; selection of fungal stains and preliminary direct microscopy techniques; and use of appropriate media and incubation conditions are all important to the accurate identification of fungal infection. This chapter provides a cursory review of the laboratory fundamentals as they relate to medical mycology. It also reviews basic taxonomy, classification, and nomenclature regarding the kingdom Fungi and changes resulting from the Melbourne Code implemented in January 2013. Also included are descriptions of mycologic terms/features common to the most frequently recovered etiologic agents in the teleomorphic (sexual) phyla Ascomycota, Basidiomycota, and Glomeromycota (formerly Zygomycota) as well as those seen in the anamorphic (asexual) fungi. Fungi without known sexual states are referred to as “mitosporic” (based upon their reproductive mitotic processes). The mitosporic fungi are the most common etiologic agents of human and animal disease.